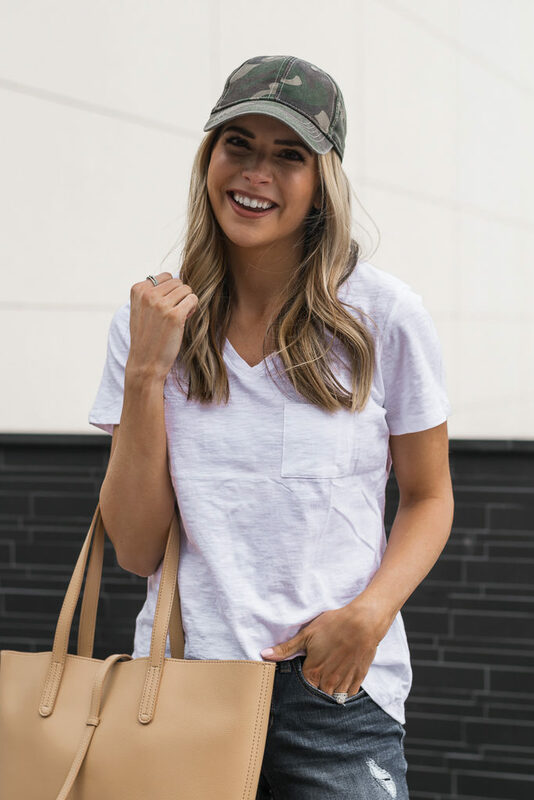 If you ever find me running around town, chances are you’ll find me in my go-to “everyday” outfit: a white tee, jeans, sneakers, cap, and a spacious tote! #momlife. 😉 To be honest though, this has always been my everyday go-to, even before being a mom. It will always be in style, comfortable, and easy to throw on! The best part of these everyday affordable closet staples are that they are from Walmart, and this entire look is just $50 total!! And that is no April Fool. 😉 The v-neck pocket tee is just $7 (TTS), distressed skinny jeans are $16 (TTS), slip on sneakers are $14 (TTS, if you wear a half size, size down), the tote is just under $10, and camo cap is just under $4! I have been SO impressed with Walmart’s fashion this past year. One of my favorite brands of theirs is Time and Tru, and this entire look is from that brand. I also love the new Sofia Jeans collection, and I shared a recent look with pieces from the launch on this post! I’m a fan of mixing high-low fashion too, so it’s amazing that Walmart also offers premium brands online! I partnered with Walmart in today’s post for their new campaign, We Dress America (#wedressamerica), which focuses on fashion for all: whoever you are, wherever you come from. They have a wide variety of trends for the whole family at amazing, affordable price points. Plus, Walmart always offers free 2-day shipping on orders over $35! Have you shopped at Walmart recently? I’d love to hear about your favorite Walmart finds if so! As always, thanks for reading, and have a great week! This post was written in collaboration with Walmart. As always, all opinions are my own. Thank you for supporting brands that support The Styled Press! I love this outfit! I am definitely hitting up my local Walmart tomorrow morning before work to see if they have the shoes and jeans. Yay! Hope your store has them!